A must-have for every animal-loving child, this is the cutest introduction to everything kids want to know about horses and ponies. Do you dream about riding a horse and want to really get to know them? Would you like to learn how to look after a horse, what kit to use, or enter ... read full description below. A must-have for every animal-loving child, this is the cutest introduction to everything kids want to know about horses and ponies. Do you dream about riding a horse and want to really get to know them? Would you like to learn how to look after a horse, what kit to use, or enter the world of equestrian sports?Discover the secrets of gorgeous horses and ponies in this fun, lively book. Packed with colourful photos, fantastic facts, and bite-sized information, The Everything Book of Horses and Ponies takes you into their fascinating world. Find out about favourite breeds from Shire horse to Shetland pony. Learn about horses and ponies from around the globe, and be amazed by their beautiful colourings and patterns. 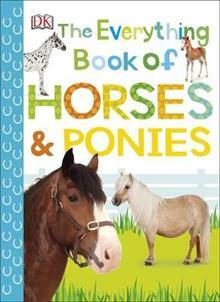 Young equine enthusiasts will be champing at the bit to read this wonderful treasury of horses and ponies.